SPROSON, W.N. B.B.C. Ouarterly, Spring 1953. Other shortcomings of telerecording can be dealt with rather more successfully; the two principal items being loss of resolution and distortion of tone gradation. It is usually possible to amend the characteristics of the picture displayed for recording in such a manner that distortions and losses known to occur in the photographic process are largely cancelled by inverse distortions deliberately applied. Most modern recording equipments have a display which appears somewhat exaggerated to the eye but is nevertheless adjusted to give a good photographic image. If the reproduced recording is to be as sharply defined as the original picture it follows that the recording process, considered as an electrical network, must have no loss up to the cut-off frequency of the television system, i.e. in our case it must be "0 dB down" at 3 Mc/s. This network will include the recording display tube, the camera lens, the negative film, the positive print, and the telecine machine. Each of these components does of course introduce some loss, but it is possible to equalize the signal fed to the display tube to compensate for the degradation occurring later. Loss of resolution in the recording process is due to the fact that the scanning spot and its images throughout the process are never of sufficiently small dimensions to record fine detail without some loss of contrast. Aperture losses of this nature are equivalent to an attenuation of the higher frequencies of the electrical signal and it is convenient to consider each loss in terms of an amplitude/frequency characteristic even though the component concerned is purely optical, since equalization must of course be an operation on the electrical signal. For any given scanning standard the detail in, say, a test pattern of black and white bars used to measure the performance of a lens  or film may be translated into terms of frequency in megacycles per second. Similarly, the fall in contrast shown by any lens or film as the test pattern is made finer and finer may be expressed as a percentage modulation where 100 per cent modulation is taken to be the contrast produced by the lens or film from a very coarse test pattern. By measuring the loss of contrast in the recording process at various degrees of image detail it is possible to determine an overall amplitude/frequency characteristic, and with the aid of an equalizing amplifier to give the signal input to the display tube an inverse characteristic. 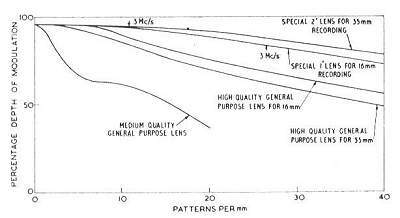 Very great improvements in the definition of telerecordings can be made by equalization of the input signal to compensate for aperture losses but it is nevertheless important that the resolution of lenses and films used for recording should be as high as possible. Losses due to these components affect the definition of the picture in both vertical and horizontal directions, but since signal equalization can only have any effect along the scanning lines and therefore bring about an improvement in the horizontal direction, any losses of vertical resolution cannot be compensated. 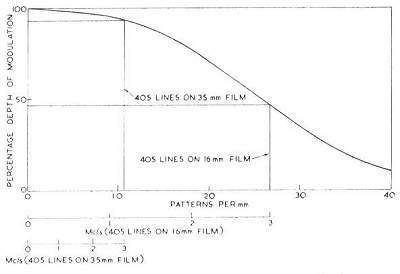 In practical 35 mm recording apparatus with high grade optical systems, the loss of vertical resolution need not be serious; but in 16 mm recordings where the linear dimensions of the frame are approximately half those of 35 mm film, the loss of resolution may noticeably degrade picture quality. An additional loss of resolution in telerecording may be caused by inaccurate perforation of the film stock. The film is manufactured to close mechanical tolerances ± 0.0005" in sprocket hole spacing, but even this small tolerance represents more than one-half the spacing between adjacent television lines on 35 mm film and more than one whole line on 16 mm film, so that in the latter case the likelihood of recording two successive television scans neatly interlaced, depends as much on the film stock as it does on the design of the recording equipment. It will be seen from these remarks that good definition in the telerecording necessitates very high quality optical arrangements, a high-resolution film and in addition some electrical equalization to restore partly the losses due to these components. In view of the fact that the resolution of a television system is not high compared with that of normal photography, it may at first seem strange that lenses and film capable of producing a sharply defined photograph of a natural scene may be inadequate for television recording. The explanation lies in the fact that in the natural scene the fine detail may, in television terms, extend to a very large number of megacycles per second; and although lens and film can record this detail at only a small percentage of its true contrast the information helps to create a subjective impression of sharpness. Where the subject matter is a television image, the detail presented is, however, so limited that any loss of contrast is immediately noticeable.